Sakura Watch, April 4, 2012 - Blooms have begun! Sakura Watch, April 4, 2012 - While walking by the soccer fields this afternoon, I finally found the first fully blooming white blossoms! It's still the very, very early stages and I would estimate that it is less than 1% of the possible blooms beginning to show today. Though this greatly encourages seeing the trees blossoming by the holiday weekend. The notable differences were down toward the winding path of Japanese Cherry Tree overlooking Grenadier Pond that the stubborn buds still seem to be holding back and stubbornly bulging with brighter pink colours with barely any hints of white yet. Could it be a result of the cooler temperatures and winds coming from the pond and lake? We'll keep checking on the progress daily and posting it on the site. If you've seen any other signs of more blooms let us know! 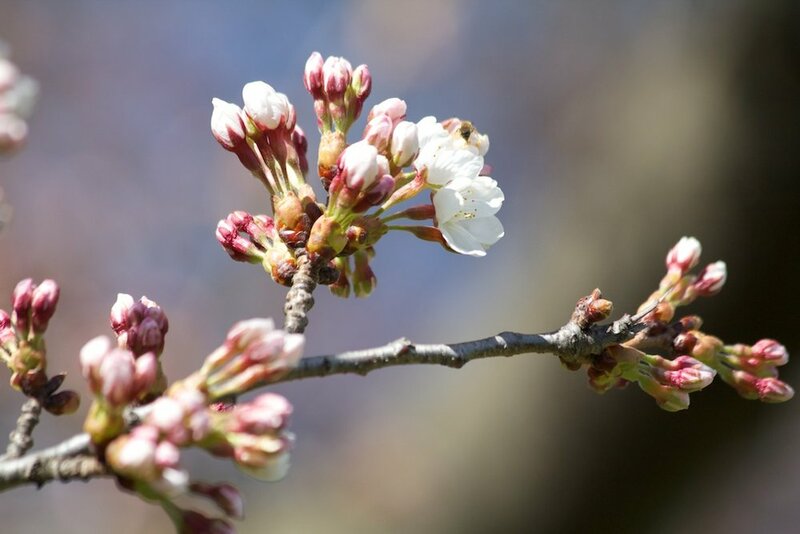 Sakura Watch, April 5, 2012 – More signs of blossoms, but will they bloom by Easter Sunday? Sakura Watch, April 3, 2012 - Buds are getting bigger!